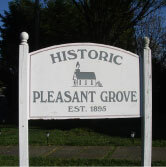 Historic Pleasant Grove Church is a landmark with a once-humble history nestled in now prosperous McLean, Virginia, outside of Washington, DC. Built by African and Native Americans and other local residents in the late 19th century, the simple-yet-striking structure has been restored and is now available to rent for community events. The Frances K. Moore Memorial Museum, dedicated to the church founders is also located on the property. Tours are available upon request and during public events. a spirited Christmas Musical Program in December. Sign up to the left for the latest information on upcoming events and opportunities to participate. Join us for our 33rd annual Spring Fair! Enjoy our popular Bake Sale, Lunch Grill, and Attic Treasures table or join us in sprucing up our historic space inside and out. We will be accepting Attic Treasure item donations on Saturday, June 8th from 11am to 1pm.